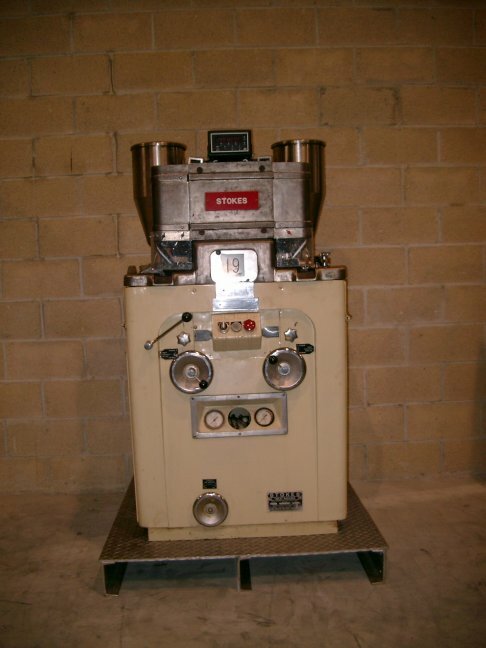 Used Stokes Model 540-41, 41 Station High Speed Rotary Tablet Press. Serial #T35394. This is a Double Sided Tablet Press, which has a square frame with centralized lubrication and drive system enclosed in the base. This press can make tablets with a maximum diameter of 5/8" at speeds to 2,700 tablets per minute. Comes with 2 Stainless Steel Hoppers, 2 Feed Frames, tachometer, safety switches and plexiglass guarding. Upper section is completely nickel-plated. Electrics: 3Ph/60Hz/480Volts. Was last used in a large pharmaceutical facility and is available for immediate delivery.